LETHBRIDGE, Alta. 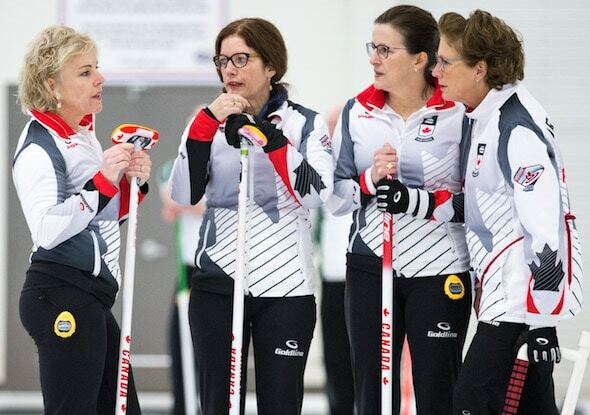 — Canada’s entries at the 2017 World Senior Curling Championships can now turn their focus to the playoffs at the ATB Centre. Colleen Jones’s Halifax women’s team and Bryan Cochrane’s Ottawa men’s team both finished first in their respective round-robin pools, and will have top seedings going into the playoff phase of the championships. 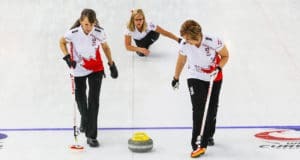 Jones, backed up by third Kim Kelly, second Mary Sue Radford, lead/vice-skip Nancy Delahunt and coach Helen Radford, completed an unbeaten 7-0 round-robin schedule on Wednesday afternoon, beating Japan’s Miyuki Kawamura 4-3 when Jones drew for a winning deuce in the eighth end. Meanwhile, Cochrane, backed up by vice-skip Ian MacAulay, second Doug Johnston, lead Ken Sullivan, alternate Howard Rajala and coach Bill Tschirhart, headed into their final round-robin game on Wednesday night (8:45 p.m.) against Wales’ Adrian Meikle (2-2) looking to tune up for the eight-team quarter-finals Friday at 10 a.m. The Canadian men are seeking a 10th world seniors gold medal for Canada. 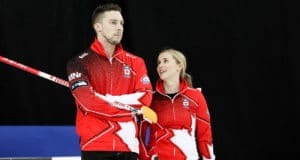 Meanwhile, Canada’s Joanne Courtney (Edmonton) and Reid Carruthers (Winnipeg) will complete round-robin play in the World Mixed Doubles Championship on Thursday at 2:30 p.m. (live on TSN) against the unbeaten U.S. team of siblings Becca and Matt Hamilton (6-0). Canada will need a victory, combined with a Czech Republic (5-1) loss to Germany (2-3) on Thursday, to finish first in its pool. Any other result will leave Canada third behind the U.S. and the Czechs. 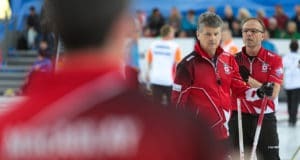 The World Mixed Doubles playoffs — a 16-team, single-knockout affair — begin on Friday at 9 a.m., with the gold- and bronze-medal games Saturday at 4 p.m.
For live scoring, standings and team lineups from the 2017 World Mixed Doubles Curling Championship, go to: http://www.worldcurling.org/wmdcc2017. TSN will be broadcasting games from the World Mixed Doubles. CLICK HERE for the broadcast schedule. For live scoring, standings and team lineups from the 2017 World Senior Curling Championship, go to: http://www.worldcurling.org/wscc2017.